A very nice even took place on July 12 in the recreation centre of Madona. Dance studio "Mantigra" in cooperation with the City Council of Madona organized the first Exotic Dance Festival. 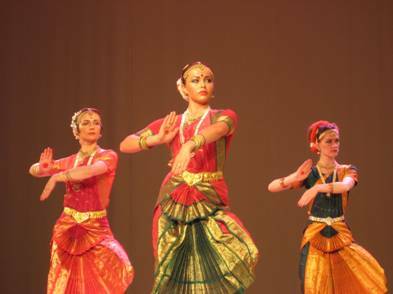 The program was extensive, because a big variety of southern and eastern dancing was performed on the stage. Dance studios from all Latvia took part in the event: „Mantigra” (Madona, Lubāna), „Malika” (Daugavpils, Krāslava), „Inda” (Jēkabpils), „Alegria” (Riga), „Horeo” (Rīga, Gulbene, Balvi, Smiltene), „Dana” (Madona), „Oriental ladies” (Jelgava), „Alfi Leila va Leila” (Madona), „Haidar” (Valmiera), „Raida” (Riga) and others. Hot-blooded Andalusian and Gypsy dances that maybe were not really represented in the classic sense, but rather a mixture of Spanish flamenco, Gypsy dance and elements of belly dancing. A wide range of belly dances accompanied both by Egyptian and Arabic music rhythms. A specific type of belly dancing that originates from America - tribal dance. Black, Gothically dressed dancers that remind of evil spirits coming from the depths of the earth, out of the swamps. Supple as snakes they meander accompanied by unique music. A great dance technique, but not a gram of emotions. The world's most famous performer of this style is Rachel Brice. The event seemed a bit too long - from 13:00 till almost 19:00, because, no matter how great the performances were, around 17:00 the number of viewers began to shrink. The last dancers who were from Valmiera seemed to be tired and there was no satisfaction in dancing to only one last row of people.